Elevate Arena is one of the newer fitness based shows/conferences in the UK, it is held every year at Excel in London. The show has been hugely successful since the first show, and has been gathering momentum ever since. The show has a unique position as it cover a much wider range of interests in the fitness industry compared to some of the other fitness conventions out there. Elevate Arena is co-hosted with two other conventions, Elite Sports Performance and Rehabilitation Expo as well as COPA Series. This convention is really a must attend for anyone in the industry or with an interest with health promotion. Elevate Arena is also one of the few free to attend events on the fitness calendar, this makes the impressive offering at the convention even more of an attractive attend. The expo leans heavily on education with a massive range of seminars and keynotes, this to me has been one of the really exciting things about Elevate, they have managed to attract a very impressive range of speakers to such a new event. The cross sector nature of the show also gives something for everyone in the health and fitness field. Additionally allows for the cross over of ideas from slightly different sectors, which in my opinion is never a bad thing. If you are anything like me and have an interest in the holistic approach to improvements in health and wellbeing then this show really allows you to get your teeth into all areas of the heath agenda. I have been attending Elevate since it started and to be honest I have never failed to find it an amazing and well run event, initially I was only attending one day of the event. However I have made the decision that the event is so valuable to me and I learn so much while there that I will attend both days going forward. Physical activity – this stream mainly focuses in on subjects around the use of physical activity to promote health. It is nice that this stream is not just taken up by the gyms and the more exercise based practitioners. There is also a great deal of time dedicated to the promotion of what many would consider lower level physical activity. With some particularly good sessions based around getting older adults and low income sections of the population more active. With this stream being supported by UKActive there is a good mixture of speakers with a good understanding of the current and future role of physical activity in the overall health agenda. Evidence base: physical activity for health and wellbeing – this stream is supported by the National Centre for Sport and Exercise Medicine (NCSEM), and the focus is working with the ever increasing evidence as to how physical activity supports an overall health life. This stream offers some great talks that bring the worlds of medicine and fitness closer together. For me the role that physical activity and exercise can play in helping with the risk reduction and management of a number of conditions is a very interesting concept. With Elevate helping to push these two communities closer together, this stream is a vital one to have a look at. 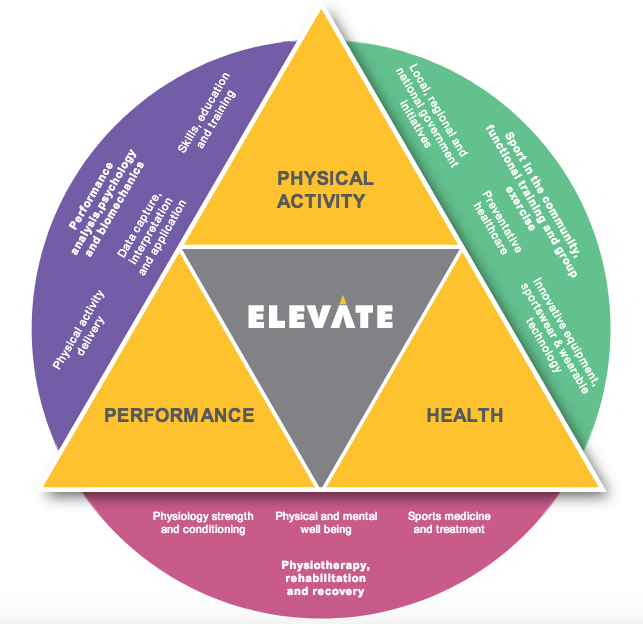 Performance – this stream of Elevate is supported by Matrix and focuses in on the higher end of the activity spectrum with talks focused around working with athletes from some of the UK’s biggest performance experts. Topics include programming, nutrition and the all important psychology. This stream has attracted some of the very best specialist practitioners from the worlds of strength and conditioning and performance enhancement. The business of physical activity – this is such an important aspect of the industry, as an industry we have a high level of self-employment. By focusing in on the all important business side of the industry, how to market and effectively run a business in our sector is a vital aspect for many attendees. The stream is supported by CIMSPA and delivers a range of talks that are aimed at both larger companies such as gyms, but also at solo or small business. I really like the streams that Elevate have put on, they give enough of a range to have a broad appeal to the attendees and also manages to draw some of the UK’s experts in the various fields. This all leads to the opportunity for many learning and networking experiences. Besides the talks there are an impressive range of exhibitors at Elevate. They have been able to attract some of the big names in the industry to showcase what they do and how it can help in the battle against physical inactivity and poor health. There are a good range of equipment manufacturers, training providers, industry associations and much more. This allows some great opportunities to network and see what the current developments in the industry are from different angles. All in all if you are involved in fitness, health and physical activity this is an important show to attend. This is such an inclusive convention with Elevate really pushing the boundaries of an inclusive approach to the improvement of the nations health. Elevate is an opportunity to learn, network and push your understanding of what the UK’s health agenda really is. With all of this available without an entrance charge it really is a must attend event! If you have not booked your free tickets as of yet have a look at the Elevate Arena website for more information.